Because bathroom remodels are expensive, complicated and time consuming, it is important to educate homeowners on the bathroom remodeling process. This enables potential clients to be sure they are spending their money wisely. Here are the top four questions we get from homeowners about their upcoming bathroom remodeling projects, and the standard answers we give. 1. How much does it cost to remodel a bathroom? For a full remodel with new everything, a 40- square-foot bathroom that has a tub, toilet and vanity sink will cost somewhere between $10,000.00 and $15,000.00. A 120-square-foot master bathroom with two sinks, a tub, a shower and a toilet will cost somewhere between $25,000.00 and $40,000.00. Wow, why so much? Because it takes a lot of labor, materials and time. For a bathroom remodel, there are as many as 20 different processes. From the first estimating call to design, purchasing supplies, lining up labor for demolition, framing, electrical, plumbing, drywall, trim, etc., there are 20 or more professionals engaged at one time or another to ensure your bathroom is all it can and should be. 2. If I don’t have that much money, how can I cut costs? 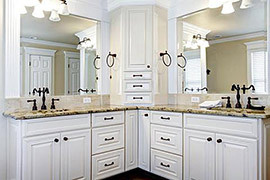 You can’t cut the cost of a bathroom remodeling project significantly. Ideas such as doing some of the work yourself, shopping harder for cheaper materials or labor and contracting the project yourself are all moves that will end up costing you more money in the long run and leave you open to a lot of disappointment and possibly a disaster that could make our original estimate seem cheap. If you don’t have the money to have the bathroom project done professionally now, wait until you do. If something breaks in your bathroom in the meantime, patch it, and keep saving or figure out how to borrow the money for a proper job. 3. How long does a bathroom remodeling project take? Plan on four weeks, and hope it gets done in three. Making sure all the design decisions are made and all the materials are on hand will help the process go as quickly as it can. Regardless, three weeks is about as fast as it can go. 4. What should I do next? Whether you are ready to start now or will need to wait a year or so to raise the money, it is never too early to start planning. Hiring a professional designer can help you get a plan together, will save you money in the long run, and can make the planning process fun. Once you have a plan you are happy with, you can put it out for bids by professional bathroom remodeling contractors. Having a plan to show contractors will let them know you are serious, and they will give you their most competitive pricing because you’ve taken out a lot of the guesswork. A fully remodeled bathroom done properly should last at least 20 years without any further significant investment. For a room that is used so personally and frequently, the cost over time is reasonable. Posted with permission from Mike Medford. Originally published at http://askmikeabouthomeremodeling.com/2013/01/30/the-top-five-bathroom-remodel-project-questions-we-get-and-how-we-answer-them/. See more of Mike’s blogs at http://www.mikemedford.com/.